The miniature Golden Retriever aims to put the classic Goldie personality into a smaller package. They are created by crossing a Golden Retriever with a smaller breed of dog. In fact, the mini Golden Retriever is usually either combined with a Cocker Spaniel or a toy or miniature Poodle. Because of their small size and similar appearance to Golden Retriever, mini Goldens are growing in popularity. But there are still some concerns surrounding this new breed mix. We take a look at the pros and cons of the adorable mini Golden Retriever. And how to find happy, healthy puppies! When researching mini golden retrievers, many people confuse them with dwarf golden retrievers. But there are actually significant differences in health and temperament between the two. It is important to understand these differences before making a purchase. Dwarf golden retrievers – unlike mini Goldens – have achondroplasia. This disorder is also known as dwarfism. Where the cartilage has developed abnormally, stunting growth. While dwarf golden retrievers are cute, selectively breeding for achondroplasia comes with risks. Spinal problems, jaw problems and breathing problems have been well-documented in various achondroplastic dog breeds. It’s important to avoid these dogs for health reasons, but mixed breed dogs can be controversial too. Because they are specifically bred from two established breeds to achieve certain traits, mini golden retrievers are considered designer dogs. And some dog breeders really object to them, as they are less predictable in nature than pure breeds. However, provided the parents are health tested for any conditions common to their own breed, there is no reason to suggest they are less healthy. And they have a better chance at avoiding recessive health problems, through a larger gene pool. The miniature Golden Retriever is a fairly recent development. The Golden himself was bred for generations as a hunting companion, and more recently as a beloved pet. Their potential mix partners, the Cocker and the Poodle, both also come from working backgrounds. So you know your pup has a good change of being intelligent and co-operative with humans. As with the dogs’ origins, it is also a good idea to research the temperament of golden retrievers, cocker spaniels, and poodles. Because this is where things can get a little messy. Mixing a golden with another breed introduces new traits. The resulting puppies will have a completely random set of characteristics based on their parents. Take each breed’s individual temperament into account when considering a mini golden. You could get any combination, and it is important that you are okay with all of them before adopting your mini golden. There’s a reason why golden retrievers are so popular – and why people want miniature version of them. For many, they are an ideal dog breed. Friendly, easy going and clever, they make great family pets for most homes. Because they are so adaptable, they get along well in households that have other pets and children. Better yet, golden retrievers are very loyal. Adopting one guarantees you will have a friend for life. Cocker Spaniels are gentle, friendly, and smart. They do well in active families that have the energy to take their pet outside for exercise. However, there can be temperament issues in some lines of American Cockers. Regardless, they are all active dogs and your mini Golden Retriever might well carry on this trait. Poodles are calm in the house, yet smart and active. It is this intelligence that attracts many who desire an obedient dog who can quickly pick up tricks. They are eager to please their owners, but can need a lot of socializing to be as keen to spend time around others. Again meeting the parents will be important to establish whether their personality is one you would want reflected in your pup. Your mini Golden Retriever’s personality will depend upon their parents, and how well socialized they are when you bring them home. From working lines, this mix will regardless be likely to be clever, cooperative and rather active. Early, thorough socialization will help to ensure that they are a settled and friendly pet. Goldens, Cockers, and Poodles all have a similar energy level. With Cockers perhaps being the liveliest, even indoors after a busy day. Each enjoys being outside and getting plenty of exercise. They are also easy to train using positive reinforcement. Although they might well have a high hunting drive, so careful training around prey species will need to be carried out. Because miniature Golden Retrievers are not standardized, their health can vary from litter to litter. To give yourself the best odds of a healthy puppy, make sure the parents are fully health tested. Here are the conditions your breeder needs to be aware of. As happy-go-lucky as they are, Golden Retrievers still come with health concerns. Your pup’s parent of this breed must have great hip and elbow scores, a recent clear eye test, be PRA clear and have no family history of cancer. Cancer is sadly rife amongst Golden Retrievers. It is hoped that crossing them to other breeds might reduce this, but at this stage we don’t know for sure. In fact, a health survey conducted by the Golden Retriever Club of America found that more than 18% of goldens suffer from a form of cancer known as hemangiosarcoma. Cocker Spaniels are fairly healthy dogs, but they still need to have good hip scores, and a recent clear eye test. 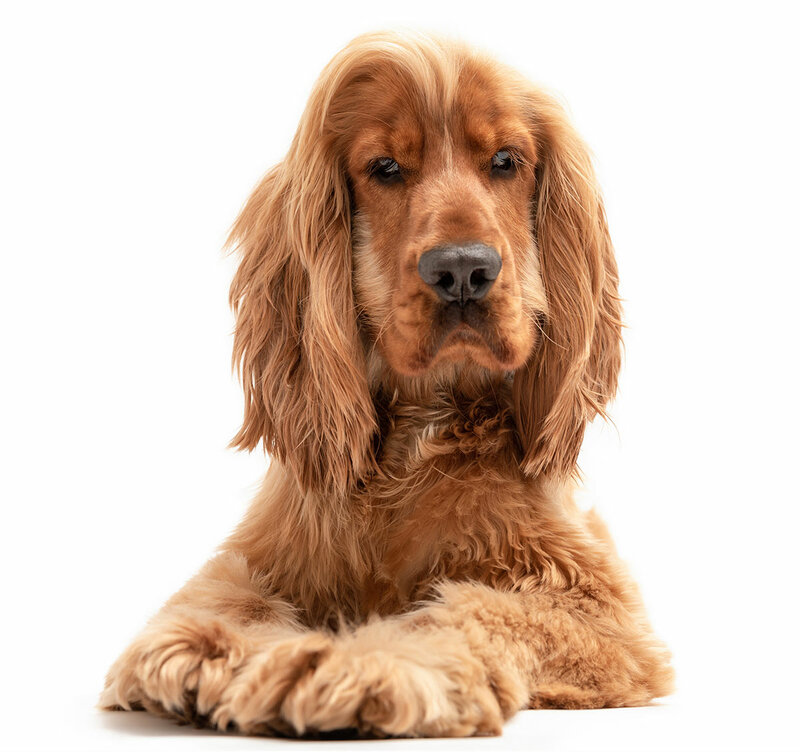 Eye problems are common in spaniels, and health testing is a good way to avoid them. They should also have no family history of liver disease or blood clotting problems. 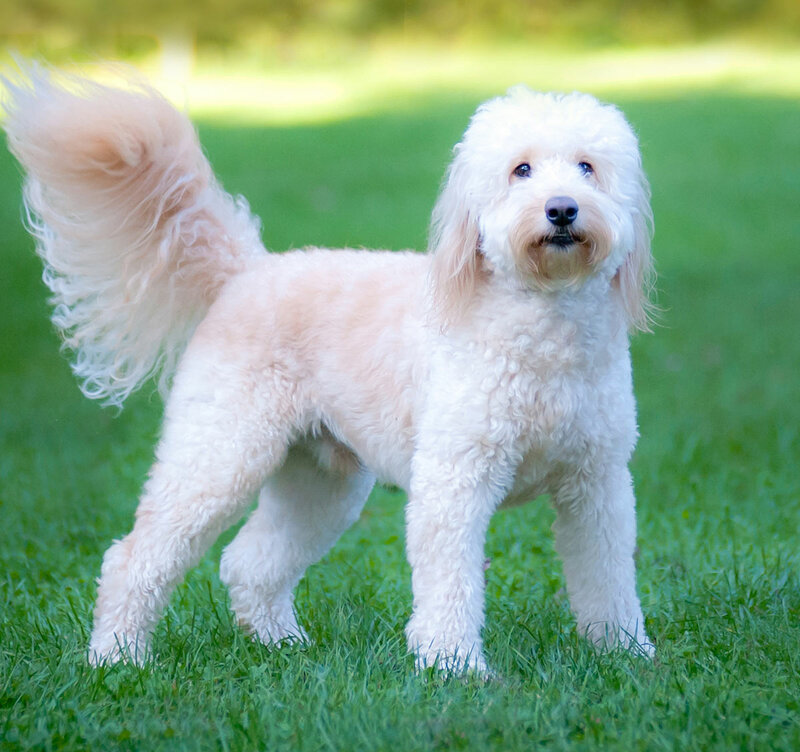 Hip dysplasia, common in all dog breeds, are also present in Poodles. In addition, many poodles face significant eye problems. Idiopathic epilepsy, which can cause seizures is something else to be aware of. Another common issue is von Willebrand’s disease, a bleeding disorder. Hormonal issues and bloat are also common. Toy and miniature poodles face orthopedic problems as well. For example, Legg-Perthes – a bone disease that causes the femur head to decay. Regardless of the mix that made them, both your miniature Golden Retriever puppy’s parents must have full health tests. Even if the breeds don’t share common ailments. It is incredibly important to also try to find a Goldie parent with no family history of cancer. An older Golden Retriever parent might be less likely to carry the gene. Poodles are known for their coats, which many owners take great pride in grooming. A miniature golden retriever is not likely to grow quite an elaborate hairstyle, but there is some care involved. 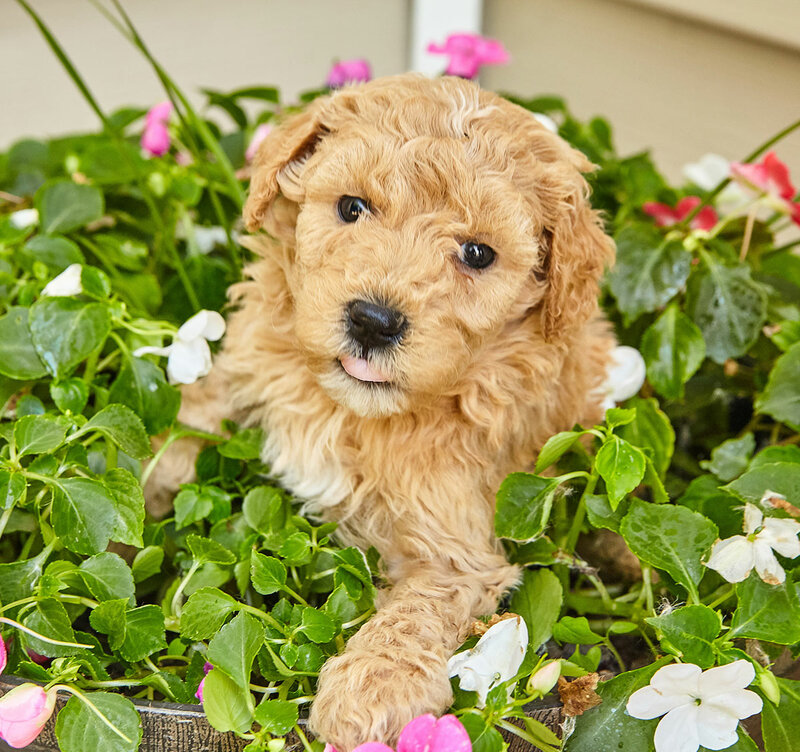 Golden Retriever Poodle mixes may have either tightly curled, wavy, or silky smooth coats. Goldens crossed with Cockers, on the other hand, may have long, flowing coats with straight or wavy hair. Cocker spaniel hair needs regular brushing. But no matter how much you brush, the hair is bound to get everywhere. Like cockers, mini goldens may have oversized ears and therefore be prone to ear infections. Check and clean them regularly while grooming. Due to the unknown nature of designer dog breeds, it is important to be cautious when searching for a Mini Golden Retriever puppy. Health testing is the number one thing you can do to ensure your happiness with your dog. If you come across a breeder who does not provide a health test, it is best to walk away. Health tests will also help you verify that a miniature Golden Retriever is not actually a dwarf Golden Retriever. The best place to find mini Golden Retriever breeders in your area is by looking online. But you do need to be very careful about going through all the right checks when purchasing a puppy this way. Do follow all the steps in our puppy search guide to make sure you get a puppy that has been well-cared for and socialized properly. Because mini Goldens are still rare, miniature Golden Retriever rescues are not established in most areas. You may be able to find one at a Golden Retriever rescue or humane society near you. Should I Buy A Miniature Golden Retriever? 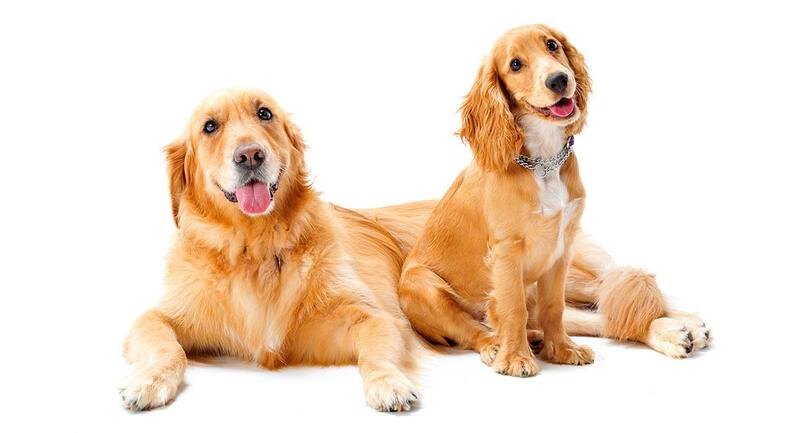 Given the energy of Golden Retrievers, Cocker Spaniels and Poodles, a miniature Golden Retriever would likely do well with a family that can help it get plenty of exercise. Each breed is highly trainable, too. Golden Retrievers are eager to please, making them receptive to training. The Cocker or Poodle influence in a mini Golden may cause temperament traits less desirable in a family dog. But good training and socialization will do wonders with these mixes. Health and temperament are very important. Make sure that you meet both parents and that they are both fully tested for any diseases that might relate to their breed. ABC News: Are Designer Trends Bad For Dogs? Ackerman, Lowell J. The Genetic Connection: A Guide to Health Problems in Purebred Dogs, 2011. Ljunggren, Gunnela. “Legg-Perthes Disease in the Dog.” Acta Orthopaedica Scandinavica, 1967. P.F. Jezyk. “Constitutional Disorders of the Skeleton in Dogs and cats.” Textbook of Small Animal Orthopaedics, 1985. What type of puppy is the one on the free updates and news slip? Hi my name is Mary and I’m interested in a beagle!